Announcement Hello! You've come to the right place. My works are created to delight your eyes with their rich textures and elegant embellishments, all put together with great care for details. These beautiful bags are made with special traditional techniques and whether their design is modern and minimalist, romantic and vintage or playfully colored, they have that distinct handcraft feature that makes them more than just stylish useful objects. The secret in choosing the right one for you is to look beyond their outside beauty and the aesthetic aspects, you must feel the one that was made especially for you. Most of my bags are unique works of art, one of a kind original fashion accesories for you to love. ~1-2 weeks to Europe, 2-3 weeks or more everywhere else, worldwide. I can't predict postal delays, so buy at your own risk if you have a deadline! Hello! You've come to the right place. So beautiful and perfect for my needs! The seller is wonderful and shipping to the US was fast. The leather is amazing, very high quality! brown leather tote, bag with pockets - handmade designer leather bag - italian quality leather "FRANCESCA"
The quality is amazing and the pictures don't do it justice. It's perfect and I love everything about it. It's going to be hard to give away as a gift, but I did buy it for someone else. The shipping was super fast. I was surprised that it came in just over a week. 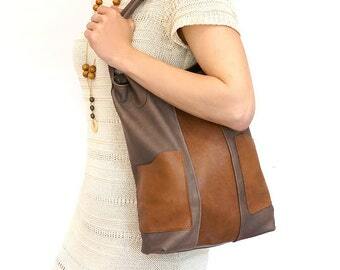 lined leather tote – handmade fashion bag - bag with pockets - genuine leather bag - purse with pockets "SERENA"
Beautiful! And the shipping was fast. I am very pleased with my purchases (I bought more than one). I will be buying more. handmade red leather bag – lined leather tote - zipper red bag with pockets - genuine leather crossbody bag - purse with pockets - "ROSANNA"
Welcome! I do my best so that all of my customers are completely satisfied with their purchase. For any inquiry please Convo me and I'll be happy to assist you. ✿ IF LOST: You will receive a refund if the package is lost. Package are considered delayed after 5 weeks spent in postal transit. ✿ IF FAULTY: If the product doesn't meet your expectations, please let me know. ✿ IF UNCLAIMED: Please check your mailbox regularly, reshipping will incur a $8 handling fee plus standard shipping fee. If I contacted you after a package returned and you did not responded within two months, I will consider you do not want the bag anymore and treat it as abandoned. ✿ CUSTOM ORDERS / PERSONALIZED items - if you requested any modifications to an item, you can only receive a refund if the item was lost in the mail or such, not for buyer's remorse, unclaimed package etc. ✿ INSURANCE: All my packages are insured. ✿ SHIPPING ADDRESS: I'll ship the item to the address you provided in Etsy Checkout and not the one on your PayPal. Please make sure that is address you expect the item to be shipped to. ✿ DELIVERY Signature is required for delivery, if the postman doesn't find someone at the address, he'll leave a notice to pick it up from your local post office. If three weeks have past and you haven't received the package or a notice, please call your post office to ask if they have your package. I ship from Romania worldwide. Usually it takes two - three weeks for a package to get to any destination. If you have a deadline, please keep that in mind and let me know before the purchase, after I've sent it there is nothing I can do to speed it up! I cannot predict and am not responsible for international delays due to random custom checks. ✿ EXPEDITED SHIPPING is available with EMS, ask for a quote if you are interested. For one standard bag it is about $42 to US. I am at your service for any questions, do not hesitate to contact me!